Heat oil in a pan and fry the onion, ginger and garlic paste for 4-5 mins till all the water dries up and the paste is light brown in color. Add the chicken pieces to the paste and saute for couple of minutes. Add turmeric, red chilli powder, salt, cumin powder and coriander powder and mix well so that the chicken pieces are nicely coated with all the masalas. Add the chopped tomatoes and cook for 3-5 mins. If the masala starts sticking to the pan, sprinkle a bit of water and cook till the chicken becomes tender. Turn of the heat and serve with Rotis/ Parathas. Note : This recipe is for dry chicken and thus does not have a lot of gravy. If you wish to have this dish with rice , you can make it with gravy by adding 1 cup of yogurt along with the chicken pieces while cooking. Additionally, if you do not get fresh fenugeek leaves, you can replace it with 1 cup Kasturi Methi ( dry fenugeek leaves) . 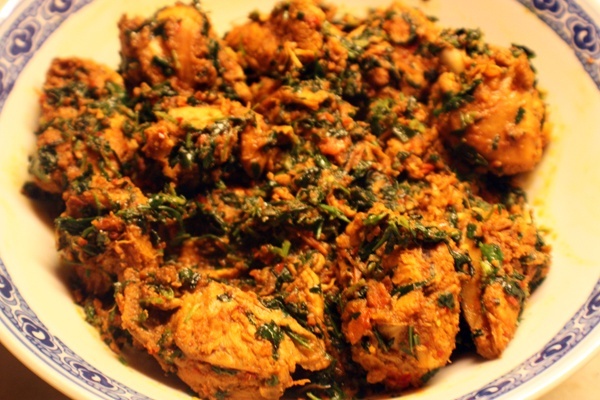 This entry was posted in All Recipes, Chicken and tagged Methi, Methi Chicken by Kamakshi. Bookmark the permalink.